In 1937 Shanghai--the Paris of Asia--twenty-one-year-old Pearl Chin and her younger sister, May, are having the time of their lives. Both are beautiful, modern, and carefree--until the day their father tells them that he has gambled away their wealth. To repay his debts, he must sell the girls as wives to suitors who have traveled from Los Angeles to find Chinese brides. As Japanese bombs fall on their beloved city, Pearl and May set out on the journey of a lifetime, from the Chinese countryside to the shores of America. Though inseparable best friends, the sisters also harbor petty jealousies and rivalries. 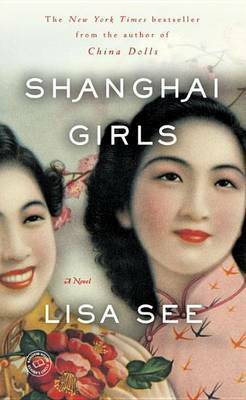 Along the way they make terrible sacrifices, face impossible choices, and confront a devastating, life-changing secret, but through it all the two heroines of this astounding new novel hold fast to who they are--Shanghai girls. Lisa See is the New York Times bestselling author of Peony in Love, Snow Flower and the Secret Fan, Flower Net (an Edgar Award nominee), The Interior, and Dragon Bones, as well as the critically acclaimed memoir On Gold Mountain. The Organization of Chinese American Women named her the 2001 National Woman of the Year. She lives in Los Angeles. From the Hardcover edition.